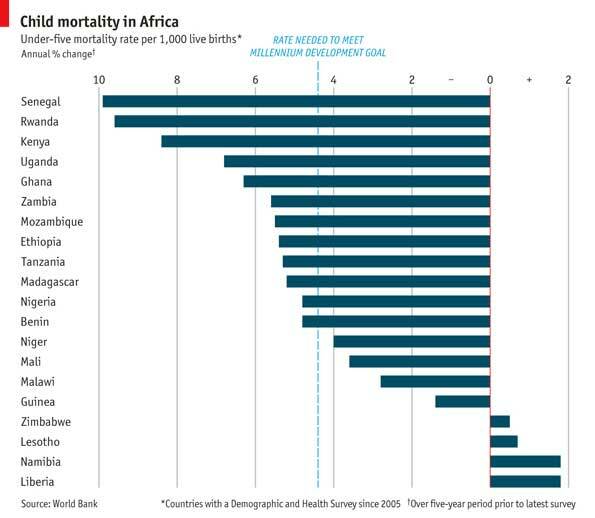 Child mortality in Africa has plummeted, belying the continent’s “hopeless” reputation. The chart below shows the change over the most recent five years in the number of deaths of children under five per 1,000 live births. Sixteen of the 20 have seen falls, but the more impressive finding is the size of the decline in 12: more than the 4.4% annual fall needed for the world to achieve its millennium development goal of cutting by two-thirds the child-mortality rate between 1990 and 2015. The top performers, Senegal and Rwanda, now have rates the same as India. It took India 25 years to reduce its rate from around 120 child deaths per 1,000 births to 72 now. It took Rwanda and Senegal only about five years. Michael Clemens of the Centre for Global Development, a think-tank in Washington, DC, calls this “the biggest, best story in development”.